We live at a time when social megatrends present the planet with wicked problems that are broad, challenging and complex. The answers to these global challenges require an ambitious approach that integrates big science and engineering ideas with a comprehensive understanding of the underlying social and policy dynamics. Furthermore, in today’s era of rapid advances in science and technology, the convergence of traditional STEM disciplines and novel information science and data-based approached presents a unique opportunity to devise new solutions to global challenges. As a world-class institution that is keenly focused on societal impact, Purdue University is uniquely positioned to bring all of these disciplines together to foster creative, comprehensive solutions to global challenges. Discovery Park at Purdue University is an open innovation laboratory for transdisciplinary collaboration focused on the grand challenges in global health, global conflict and security, and sustainability. At Discovery Park, we answer the call to solve global challenges by focusing on disruptive innovation. Researchers move beyond and across traditional boundaries, collaborating across disciplines and with policy makers, economists and business leaders to create solutions for a better world. We bring all of Purdue’s institutional strengths together to tackle global challenges and accelerate the delivery of practical solutions that impact society in direct and tangible ways. To spark additional interdisciplinary research on global challenges, we have launched a program called “The Discovery Park Big Idea Challenge”. The program provides resources to interdisciplinary teams of Purdue faculty and students pursuing bold proposals. These projects position the university as a leader in generating new insights and game-changing, disruptive contributions to solving global challenges in health, security and sustainability, as well as in the enabling science and technology of the digital and nano revolutions. The path to meeting these goals is long and complex. Although this program cannot provide the full resources required to create the ultimate solution to a global challenge, it is designed to nurture ideas and create opportunities for new and significant external funding—both public and private. 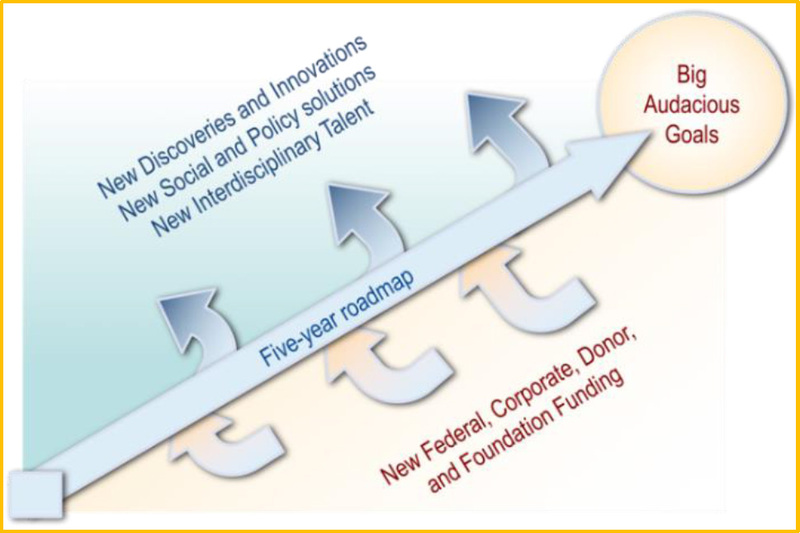 At the same time, it charts new pathways to discoveries, innovations, and social and policy solutions, while training the next generation of future interdisciplinary talent. One Health: The science of animal and human disease, and the future of healthcare. Global security and defense innovation, including Third Offset technologies (Autonomy, robotics, cognitive systems, hypersonics, etc), policy studies, energetics and propulsion, cybersecurity, rapid prototyping and manufacturing, and related themes. The future of nanoelectronics, photonics, and computing, both architectures and algorithms. Proposals should outline how the team will work with at least one, and preferably more than one, Discovery Park Research Center, and should be endorsed, via email to the Discovery Park Executive Director, by at least one Center Director. Center Directors may support as many proposals as they wish. Proposals should incorporate elements related to entrepreneurship and policy dimensions of the global challenge, as appropriate. The program funds several teams for up to two years (depending on scope of the proposal) with a pool of strategic investment resources (see below). The proposal must clearly identify a team leader and project champion who must be an experienced faculty member. Emphasis will be placed on milestones that demonstrate progress in soliciting and gaining new funding for research from sources external to Purdue in the topical area of the project. A detailed budget request aligned with the milestones should also be included, but will not count toward the two-page limit. It is expected that a typical project will have a budget of up to $300,000 per year. However, final budget determinations will be made after selection based on final scope and schedule. Budget resources will be provided by Discovery Park. There is no need to show cost-share in the proposals. Full budget allocation to the project will be contingent on satisfactory progress in meeting the bi-annual milestones. The Discovery Park business office will be available to help with budget determination and structure. Budget questions should be directed to Donna J. Brown (brown746@purdue.edu) in the Discovery Park business office. In addition, to help teams assemble and construct an effective proposal, personnel in the Agile Strategy Laboratory in Discovery Park will be available during the Fall 2016 semester to assist teams in developing their Value Proposition. Please contact Ed Morrison (efmorris@purdue.edu). Proposals will be due to the Discovery Park office by December 20, 2016. Presentations for selected proposals will take place on February 23, 2017. Please submit all materials to Ms. Lisa Muncy (lamuncy@purdue.edu). 1. How many proposals will the Big Idea Challenge support? Answer: There is no specified number at this time. The decision will rely on the quality of proposals. 2. Can students participate in the Big Idea Challenge? Answer: Yes, students can participate under the lead of a faculty member and with the support of at least one Discovery Park center/institute director. 3. What is the page length for the proposal? Answer: Two-pages for proposal narrative plus a budget page that can be unspecified in length (preferably one additional page for budget). 4. What is the deadline for submitting the proposal narrative? Answer: Proposals are due December 20th. 5. The RFP mentions that the team leader should be an experienced faculty member. Does that mean a faculty who is tenured? Associate or full professor? Answer: There is no special requirement that the faculty member be tenured or have a specific title. Experience will be based on the faculty’s past contributions in his/her field of research and potential for advancements of that research. 6. Do you require a letter of interest? Answer: A letter of interest is not required. Per the instructions, however, proposals should align with Discovery Park’s strategic framework and have the support of at least one Discovery Park center/institute director. 7. Are partnerships from outside universities and organizations allowed? Answer: Discovery Park is open to and encourages partnerships if proposal teams feel their resources can be utilized to incentivize partnerships and bring people in from outside and create a global team. We hope to attract both national and global partnerships. 8. How does team composition of faculty members and grad students affect how a proposal will be judged? Answer: We suggest that a more senior faculty member act as the team leader, but it is not an exclusive requirement. Judges will look primarily at how compelling the idea is, what the potential is for funding, and the experience and quality of the team as a whole. Junior faculty and students are also welcome to participate and submit proposals for consideration. 9. Can proposals also be a part of the Horizons program? Answer: The focus of the Big Idea Challenge is a little different than seeking to create a new field of scholarship. Here, we are trying to form teams together around a big issue or challenge that participants are an expert on. Furthermore, the Big Idea Challenge is not part of a seed grant program; rather, the goal is to provide a set of resources to help facilitate the development of the thought leadership that will solve a big challenge. This initiative seeks to provide resources to nucleate interdisciplinary teams and help them grow with leadership, funding, and resources from outside Purdue. 10. Can entrepreneurship play a role in Big Idea Challenge proposal submissions? Answer: One of the centers at Discovery Park is the Burton Morgan Center and the Purdue Foundry is based in the Burton Morgan Center. If teams feel that there is are entrepreneurial components of the proposal being developed, the Foundry and Burton Morgan Center will be right there to help pull those aspects together. 11. Since the proposal calls for collaboration with Discovery Park Centers, are there other ways these solutions can leverage DP resources? Answer: As you think about your proposal and ideas, keep in mind that Ed Morrison, of the Purdue Polytechnic Institute, and the AGILE Strategy Labs are an on-campus resource. He is the designated contact to help facilitate sessions and discussions with teams and help applicants think about how to put a proposal together. 12. How many projects are you looking to fund? Answer: We are hoping to fund three to four for a maximum of two years each, maybe a little longer depending on the size of the scope. If these are successful, then hopefully we can fund more in the future. 13. Can grad salaries and tuition remissions be budgeted on our proposal? Answer: Yes, grad salaries and fee remissions can be part of the proposed budget. There are no restrictions regarding budgeting salary or tuition on these funds. 14. Can a portion of faculty time/effort be budgeted on our proposal? Answer: Yes, faculty salary can be a part of the proposed budget. There are no restrictions regarding budgeting salary or tuition on these funds. 15. Will F&A need to be a part of our budget? Answer: No, Incentive funds are university general funds and therefore, F&A should not be budgeted. 16. Can a faculty member join more than one team? If so, are there any restrictions on numbers of teams they can have a leadership role in? Answer: Yes, a faculty member can join more than one team. There are no restrictions on leadership roles or involvement levels for proposal submissions. 17. Should budgets for proposals be formatted in a specific way? If so, how? Answer: There is no required formatting for proposal budgets. An example budget can be found here. 18. May I add references to the proposal and if so, will references be counted in the 2-page limit? Answer: Proposals can include references, if necessary, but should be attached as a separate sheet. They will not be counted toward the two-page limit. 19. What are the length guidelines for proposal submissions and what materials should I include? Answer: Proposals narratives must be no longer than two pages, not including references (if necessary) and the required budget attachment. A title page with author names and their affiliations should also be included in the proposal material and does not count toward the two-page narrative limit. 20. Our team has non-Purdue collaborators. How should they be listed in the budget? Will the grant cover their institutional indirect costs? Answer: You can list the collaborators under S&E, but it will be important for us to understand if Discovery Park will be paying them to provide a service, or if are they integrated into the scope of the project. In general, these grants are expected to be spent at Purdue and growing Purdue capability and impact. With regard to institutional indirect costs, the awards will not cover those. Typically, institutions understand that since Purdue is a public institution, we are not subject to those costs. Teams will need to make it very clear that collaborators outside of Purdue cannot charge indirect costs to Purdue. 21. Will teams selected to give oral presentations be given feedback beforehand so they know what to speak to during their presentation? Answer: Yes, notes and questions from the selection committee will be given to those moving to the next round, and may include a suggested list of other Centers within Discovery Park that their team should consider contacting for partnering potential, if an unidentified synergy exists. 22. Are there are other budgetary restrictions (aside from institutional indirect costs from non-Purdue collaborators)? Answer: Alcohol cannot be part of the budget, per Purdue policy. 23. How does a proposal team receive endorsement from a Center? Answer: We urge teams to reach out to the relevant Center director(s) they would like to partner with for proposal endorsement. At the end of the submission process, Center directors will provide a list of endorsed projects to the selection committee.